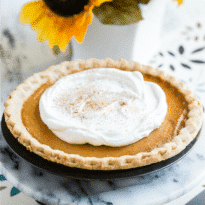 This Make Ahead Pumpkin Pie is absolutely delicious and should be at the top of your to-do list, especially if oven space is limited. It’s no-bake and egg-free, too. All you have to do is no-bake a few of these up as early as two weeks before the feast and freeze them. When you’re ready for pie, they’ll be creamy and smooth as any freshly-baked pumpkin pie. When it comes to Turkey Day, the logistics struggle is real! 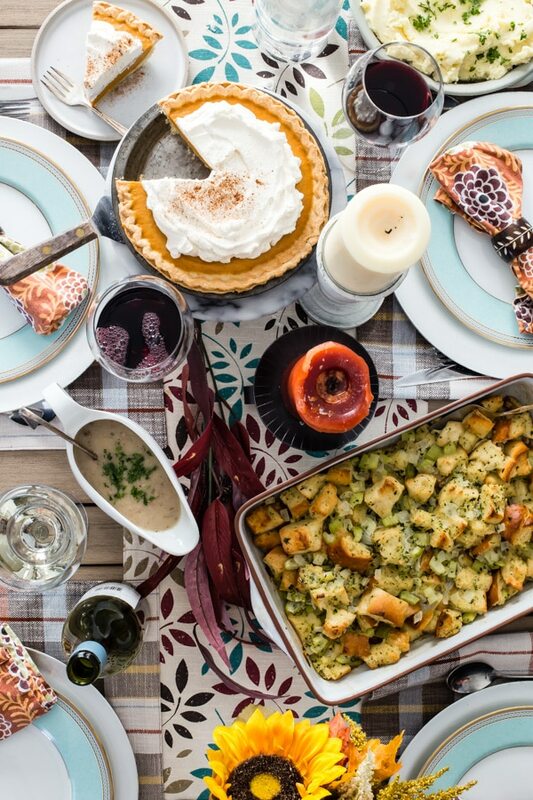 From coast to coast, anxious cooks draw up complex charts, shopping lists, and graphs weeks before Thanksgiving, just to parcel out every square inch of oven space, counter space, and refrigerator space. My mom used to wake up in the wee hours of the morning, just to get a jump start on the pumpkin pies so the turkey would have time to cook. The poor thing was exhausted by mid-afternoon. Even though I love pumpkin pie, I also love sleeping in a bit, too. That’s why this recipe for the best, easiest pumpkin pie is so appealing. It freezes beautifully, but can also be made the day you need it. And as long as you’re working with a pre-baked crust, it doesn’t take up any prime real estate in the oven. 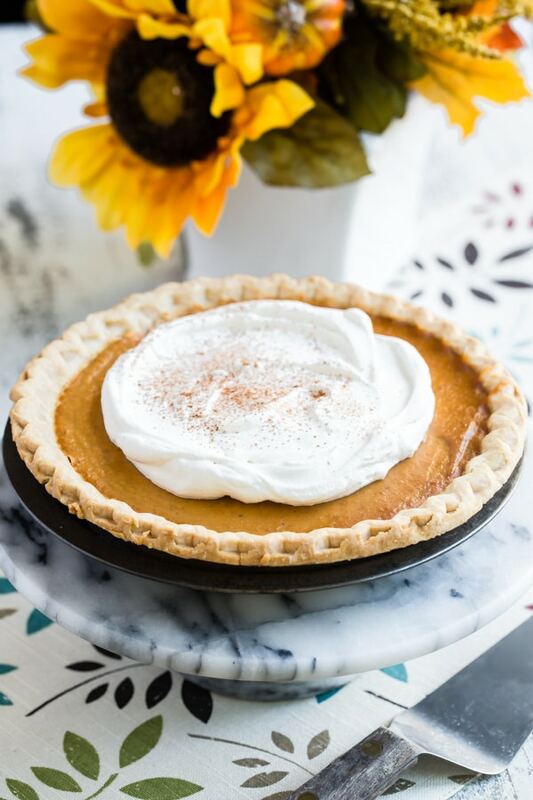 No matter how much (or little) space you have, if you love a pumpkin pie with a silky, rich texture, you’ve come to the right place. I use just the perfect amount of warming pumpkin spice and a little maple syrup for sweetness. It’s pure Thanksgiving heaven in every (no-baked) bite! How far in advance can I make pumpkin pies? While there are those who say that it’s possible to make a traditional pumpkin pie up to three days in advance, I’d rather not chance it. The custard-based pumpkin pie filling can pull away from the crust, split, and get denser over time. To be safe, anything containing eggs or dairy should be refrigerated after the first day, but who has room in their refrigerator for that? Make this pie well in advance, freeze it, and thaw it out on the counter. In five hours or less, it will be room temperature and ready to eat. What about pumpkin pie crust? This pie can be made with a traditional homemade pie crust, a graham cracker crust, or one of your favorite store-bought varieties. 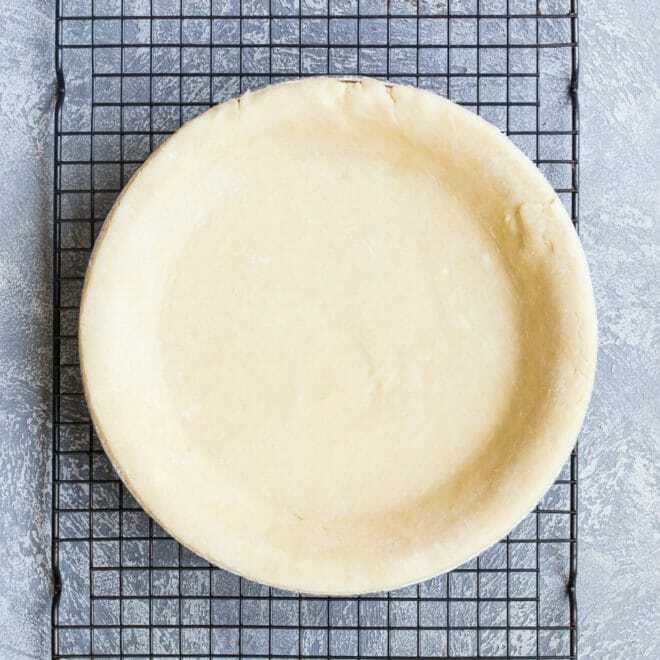 If you’re ready to try your hand at the real thing, I have a great how-to tutorial that shows you how easy it is to get the flakiest pie crust ever. I think you’ll love it! But if you’re just not ready yet, I would never judge you for going the store-bought route. We all need our beauty sleep! Making the pie crust ahead of time is a great idea. 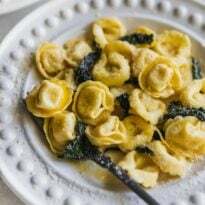 Make the dough, form it into a disk shape, and wrap it tightly in plastic wrap and foil, and freeze. This way, it will keep a couple months at least. When you’re ready to use it, thaw it overnight in the refrigerator and roll it out. 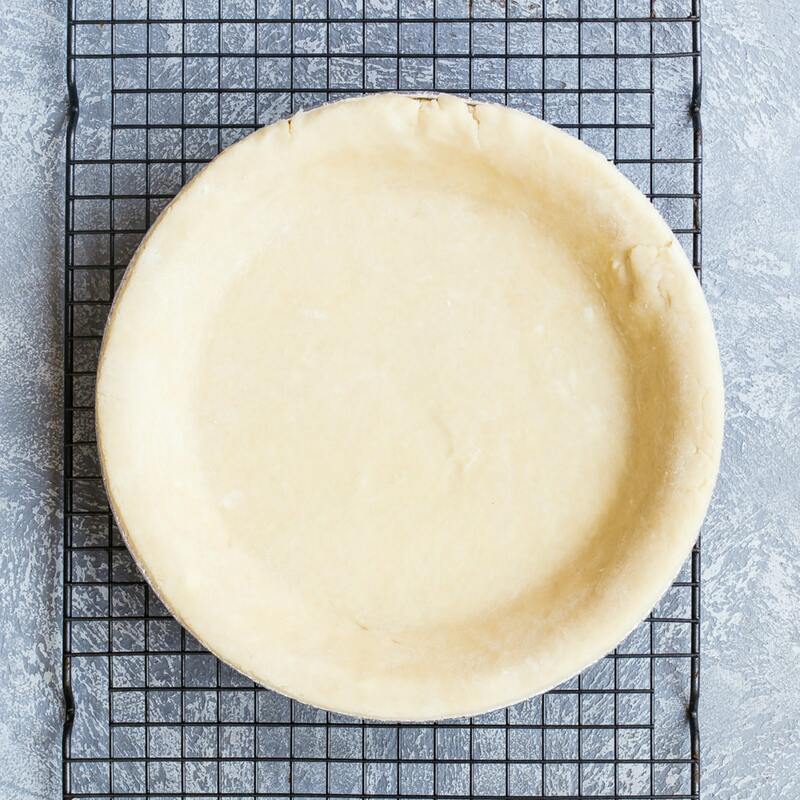 If you have the space, you can roll out your pastry dough, press it into the pie pan, and freeze it, tightly wrapped in plastic; then you can bake it straight out of the freezer without even thawing. How to you make pumpkin pie ahead of time? First, mix together the cream and the powdered gelatin. After about five minutes, the mixture should look clumpy like cottage cheese. Then, gently warm the mixture in the microwave for about a minute. Whisk briskly afterwards. The goal is to dissolve the gelatin. When the lumps are gone, move on to the next step. In another larger microwave safe bowl, mix together the sugar, pumpkin, maple syrup, and spices. This gets heated in the microwave until 110 degrees. Every microwave is different, so you may have to cook longer than a couple minutes. Once it’s warm enough, whisk in the gelatin and cream mixture and blend thoroughly. Pour into the baked crust, give everything a little jiggle to get out the bubbles, and you’re all set! The pie needs to chill for a few hours before it’s ready to freeze (or eat). As it chills, a layer of plastic wrap pressed over the surface the pie filling prevents the gelatin in the pie from forming a skin, ensuring everything stays creamy, just the way you want it. It’s a pie that’s hard to resist, so I wouldn’t blame you for giving it a taste test before the big day. You can always make another! 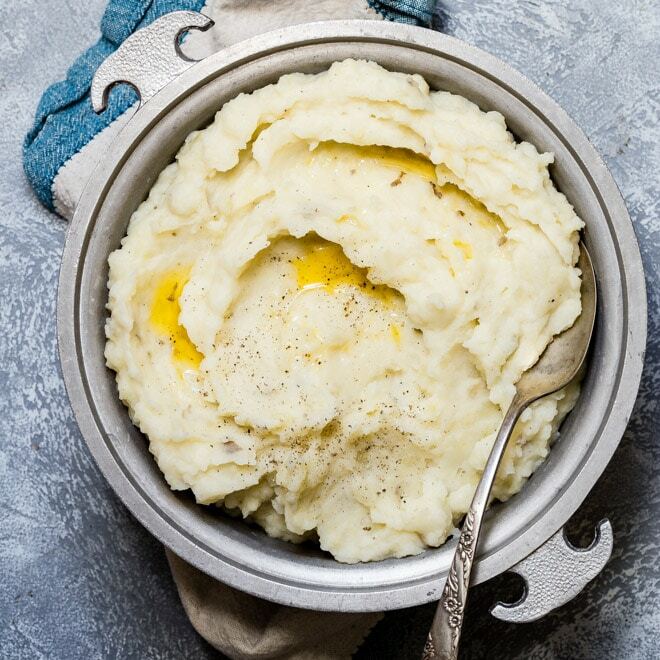 This Thanksgiving season is all about early and easy. 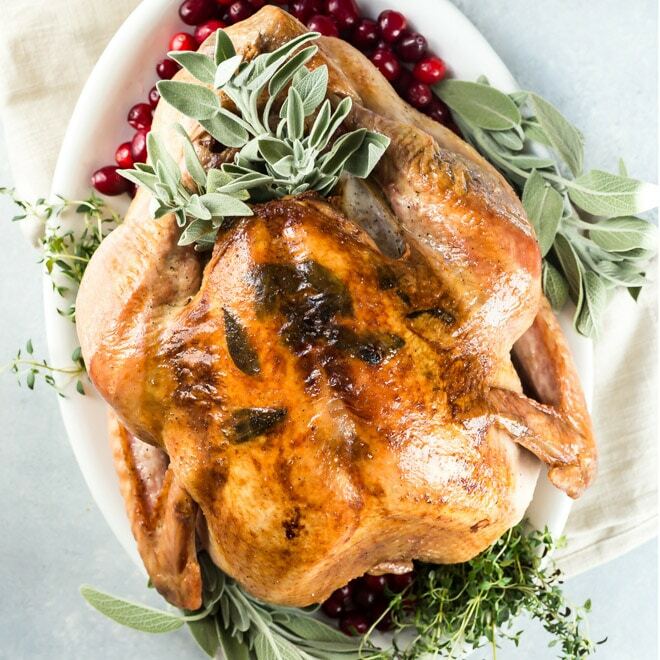 For more make-ahead inspiration, see my Make-Ahead Roasted Turkey, Make-Ahead Stuffing, and Make-Ahead Mashed Potatoes recipes, all guaranteed to make the holiday feast delicious and memorable. 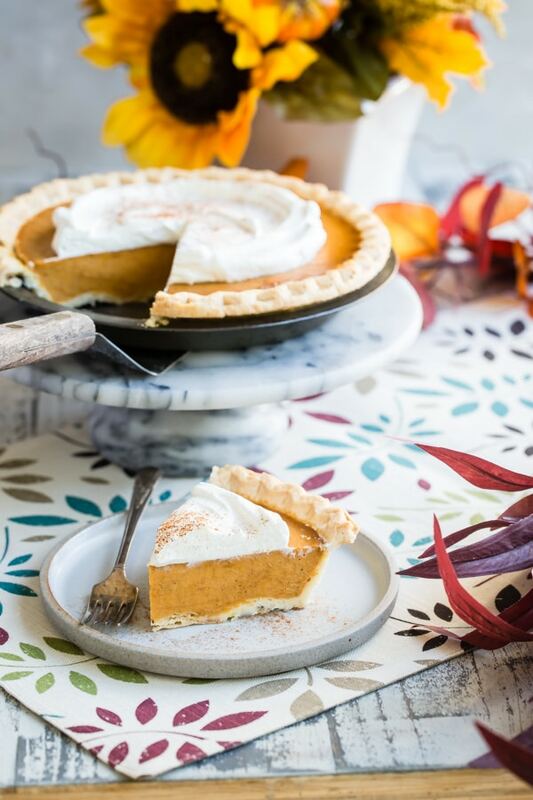 This Make-Ahead Pumpkin Pie is absolutely delicious and should be at the top of your to-do list, especially if oven space is limited. It’s no-bake and egg-free, too. All you have to do is no-bake a few of these up as early as two weeks before the feast and freeze them. When you’re ready for pie, they’ll be creamy and smooth as any freshly-baked pumpkin pie. In a microwave-safe bowl, whisk cream and gelatin until all the gelatin is wet and the mixture looks slightly lumpy. 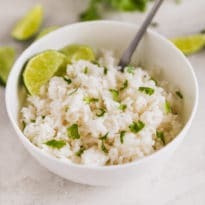 Let mixture sit until it looks like loose cottage cheese, about 5 minutes. In a large microwave-safe bowl, whisk together pumpkin, sugar, maple syrup, ginger, salt, cinnamon, and nutmeg until combined. Microwave until heated to 110 degrees, about 2 minutes, stirring after 1 minute. Immediately whisk in gelatin mixture until combined. Pour filling into crust. Gently shake pie filling so it spreads to the edges of the crust. Cool 10 minutes. Spray a sheet of plastic wrap with nonstick spray and gently press on top of the filling. Refrigerate for at least 4 hours. Or, wrap in aluminum foil and freeze for up to 2 weeks (To serve, completely unwrap pie and thaw at room temperature for 5 hours). Using a standing mixer fit with the whisk attachment, or with an electric hand mixer, whip heavy cream, maple syrup, cinnamon, and salt on medium-low speed until foamy, about 1 minute. Increase speed to high and whip until soft peaks form, about 1 to 3 minutes. Topping can be refrigerated for up to 24 hours. 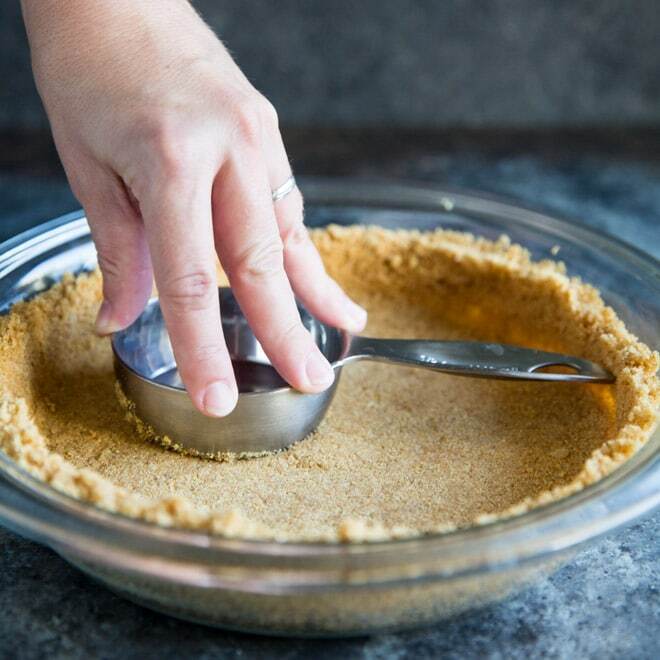 Spread topping evenly over pie before serving.